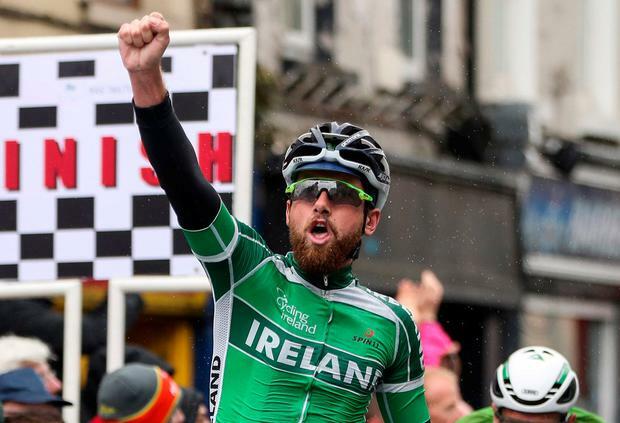 Robert Jon McCarthy took victory for the Irish national team yesterday when he blasted into Tipperary town at the head of a huge bunch to claim a rain-soaked stage two of the Rás Tailteann. After a rain-splattered day where plenty of riders came down in the last shower, McCarthy out-sprinted Dutchman Luuc Bugter (Delta Cycling) and Lindsay De Vylder of the Belgian national squad at the end of the 149km stage. It was his second career stage victory at the Rás and the result moved him up to third place in the points classification. "The rain made the stage very intense and nervous," said McCarthy afterwards. "The last kilometre was very frantic but the lads did a great job to deliver me into the final corner in a good position and it feels great to get the win." Born in Fermoy, 24-year-old McCarthy moved to Australia with his family at 14. Already a four-time Irish champion, he then beat current WorldTour sprinter Caleb Ewan to the Aussie junior road race title shortly afterwards. Snapped up by the South Australian Institute of Sport, he went on to help Ewan to a silver medal at the junior world championships for Australia before reverting back to his Irish colours after a break from the sport in 2015. Although he took a Rás stage win while riding for Sean Kelly's An Post Chain Reaction team in 2014, this year's Rás is his first time in an Irish jersey. "The Rás is a special race and although I've won here before it's a massive honour to win here in an Irish jersey." Treacherous conditions led to numerous crashes in the peloton throughout the stage and it wasn't until after the day's third climb, after almost 100km of racing, that a definitive move went clear of the peloton. 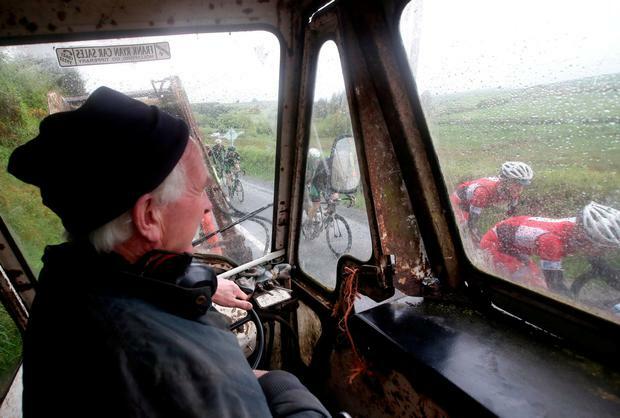 When it did, Lucan's Conn McDunphy, riding for the British-based Holdsworth team, and Leinster's Fintan Ryan worked well together in the damp conditions but the duo only held a slender 36-second gap over the field with 16km remaining. With these two reeled in 11km later, Belgian Robbe Ghys tried to upset the sprinters by surging clear in the final 2km but he was reeled in with 600m to go and the stage was set for a mass bunch sprint finish, with McCarthy showing a clean pair of wheels to out-gun Bugter, De Vylder and the rest of the field on the line. Simon Ryan of Cork Strata 3 Velo Revolution was fourth across the line and took the county rider award for the day while Páidí O'Brien of Dublin Gerard DHL moved into the blue jersey as best county rider in the overall standings at ninth. There was little change at the top of those standings with Swiss rider Cyrille Thiery holding on to the yellow jersey by virtue of his 10-second lead over Buugter, with the Dutchman making up for his two consecutive second placings by donning the green jersey of points leader. The Europcar King of the Mountain jersey now rests on the shoulders of Lukas Ruegg after the Swiss rider took maximum points on the climbs of BikePark an Silvermines yesterday. Damien Shaw is best of the Irish in third overall at 11 seconds, with Jake Gray of the Irish national team five seconds back in sixth. Today's third stage takes the international peloton on a 140km trek from Tipperary to Listowel.